The Rt. Rev. & Rt. Hon. 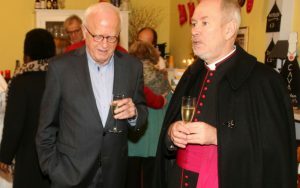 Richard Chartres is retiring at the end of February as Bishop of London. He was a great friend to St Boniface, particularly as patron of our restoration appeal during the period 2007-2011. In 2011 he visited us to rededicate the west window and baptistery. We offer him all best wishes for his retirement. “Wed 01/02/2017: It’s D-Day in Antwerp for the Low Emission Zone. As a result the most polluting vehicles will be banned from the city centre. Motorists with dirty cars driving into the zone will be obliged to pay a 125 euro fine. “In practice petrol-fueled cars older than 22 years are effected as are DERV-fueled cars that do not possess a soot filter and are older than ten years. Cameras check all cars entering the zone. Cars with Belgian number plates will be compared to an automatically compiled list showing all cars that comply with the stricter norms. For foreign drivers this is not the case. This is why it is crucial that foreign motorists heading for Antwerp register beforehand in order to avoid the 125 euro penalty”. St Boniface is situated inside the Antwerp Low Emission Zone. If you’re coming to us by car, and particularly if you have non-Belgian plates, please check the details on the official website. 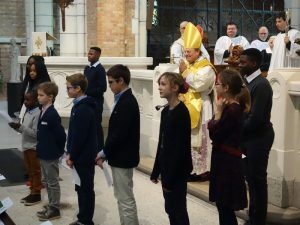 Last Sunday Bishop Norman confirmed 11 young candidates – a joyous occasion for St Boniface. There are more photos here. 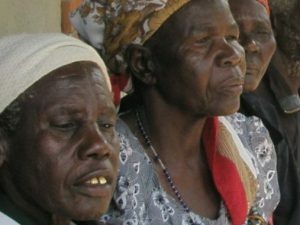 Reminder: the benefit lunch for Nyumba ya Wazee, supporting an old people’s home in Uganda, takes place in the Church hall on Sunday 5 February from 12:00 to 15:00. Prices are €15 for adults, and €7 for children. Further information is available from Stellah Kakura, via seniorenhuis@gmail.com. Stellah and her friends always provide a fantastic spread – don’t miss this! Anna Barnard, adopted daughter of Benno & Deanne, was baptized at St Boniface 14 years ago. 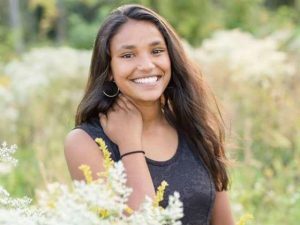 She was tragically killed in a car accident in the USA on 18th December. Her brother Christopher has established an appeal in her name, for the Mother Theresa orphanage in Delhi. Details can be found on the appeal website. 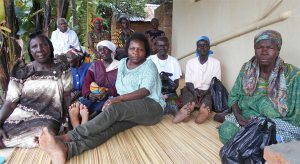 Stellah Kakura, a member of our congregation, is the founder of ‘Nyumba Ya Wazee‘, an NGO that provides help to old people in the Japanyundo region of Uganda. Through a day centre medicines, basic food and soap are provided to 35 elderly people. Their work needs to be seen against the backdrop of the 25-year war in Northern Uganda, with its legacy of stress, oppression, poor housing and lack of food and medical care, all made worse by the aids problem. St Boniface will be supporting the project with a fundraising lunch on Sunday 5 February. Financial contributions can also be made directly to the NGO’s bank account: BE 39 0004 2210 711 9, under the name Nyumba Ya Wazee, Haviklaan 37, 2100 Deurne. 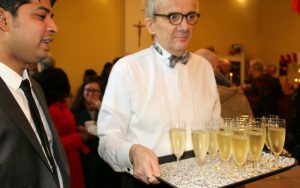 Following the Eucharist last Sunday, the congregation came together for a reception to celebrate the new year (with bubbles, of course). Many thanks to Jan Heuvelmans for the photos. There are more here. 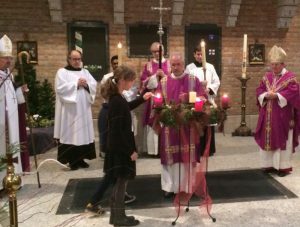 Today, Advent IV, was a joyous occasion – we were visited by both Bishop Robert and Bishop Norman, who share the Episcopal oversight of St Boniface. 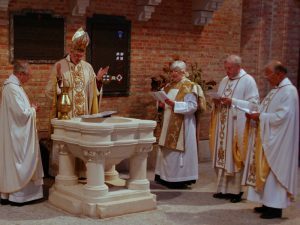 Bishop Norman was the celebrant at the Eucharist, and Bishop Robert preached. They also joined us for lunch after the service. There are more photos in the St Boniface archive.